Sludge Klear is a biological pond water treatment that targets the build-up of sludge found at the bottom of ponds. As well as being used directly in the water to target sludge, Sludge Klear can be used as a biological filter starter for ponds by helping create the perfect biological balance in your filter. How Does Sludge Klear Work? Each Sludge Klear tablet is packed with over 100 billion task-specific, beneficial bacteria that have been specifically chosen to target sludge. The bacteria break down the sludge that sticks to your pond, digesting and loosening it to enable the filter to catch it. Once this has been caught in the filter, it can physically be washed away using a hosepipe. Sludge Klear contains patented, low-temperature bacteria that is capable of working down to 4°C and can be used all year round. This allows for treatment in winter to reduce the amount of sludge and the effect of green water in spring. Sludge Klear can be used to solve sludge problems or as a regular treatment for protection and because it is safe for fish, it’s perfect for use in garden ponds, Koi ponds and natural ponds. Pond sludge is the thick brown layer of muck and grime found at the bottom of your pond. This grime gives off the smell of rotten eggs or hydrogen sulphide when disturbed. It is formed from a build-up of sediment that sinks to the bottom of the pond and begins to rot. This build-up can be made up of things like excess fish food, fish waste & debris such as leaves and twigs. For the most part, pond sludge is impenetrable to oxygen and as a result, this sludge will begin smothering the good, aerobic bacteria and algae whilst producing bad, anaerobic bacteria. Do Pond Sludge Removers Work? There is regular debate around whether sludge removers work. This depends on the type of sludge remover in question. If you are looking at chemical sludge removers then yes, they may work, but your pond has millions of living organisms in there; whilst the chemicals might not be strong enough to harm your fish, they will certainly be harming the good bacteria and algae that your pond needs. On the other hand, natural, bacterial pond sludge removers are completely safe for all living organisms found in your pond and produce safer, better results than chemicals. Bacterial sludge removers penetrate the sludge and break down the anaerobic bacteria which allows the sludge to pass through to your filters. Please be prepared to have to clean your filters every couple of days! Add some bottom feeding fish to your pond! You could try adding a couple of Tench or a few Gudgeon as these are both bottom feeders, but they don’t feed on the sludge itself. They might disturb the sludge when looking for food but they won’t intentionally eat the sludge. The best thing for eating pond sludge is bacteria and enzymes. The bacteria found in Sludge Klear is designed to break down the sludge at the bottom of your pond and enable it to pass through your filter. You could always attack it from both angles by introducing bottom-feeding fish and bacteria. The fish will disturb the sludge, making it easier for the enzymes and bacteria to digest. Is Pond Sludge Good for The Garden? We have been asked on a couple of occasions if the sludge found at the bottom of your pond can be used as compost in your garden. Short answer, yes it can. The sludge in your pond has absorbed many of the excess, useful nutrients in your pond and can be used to pass these on to your garden plants. 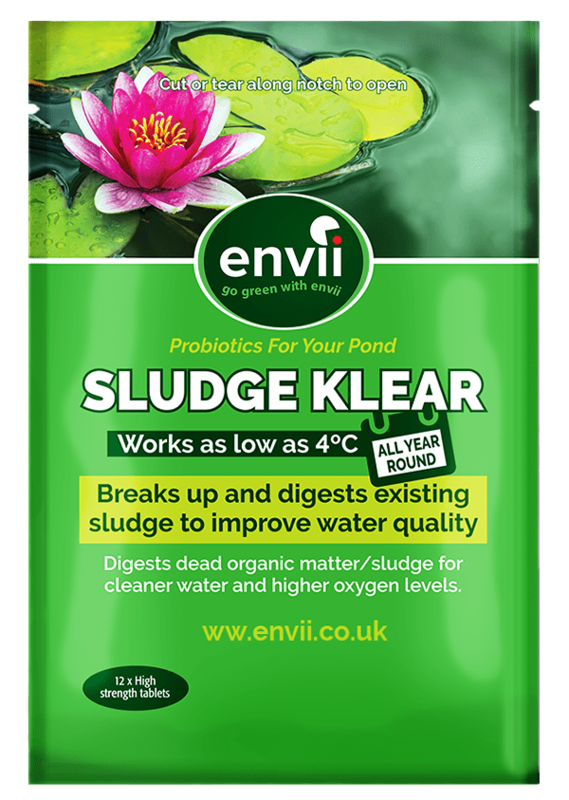 Ideally, there shouldn’t be a thick enough layer of sludge in your pond to need to use it in the garden, so keep your sludge down with Sludge Klear. If you only have a thin layer of sludge we would advise you to just use Sludge Klear and keep the layer thin. If your layer of sludge is thick, remove some by hand and place it in your compost bin. After removing some of the sludge by hand, we recommend using Sludge Klear to digest any of the remaining sludge and improve the condition of your pond. Be careful when removing the sludge if you have a pond liner as they can be very costly to replace or repair if you rip them.